Launched in 1995, TVSN is Australia’s only live TV Shopping network. 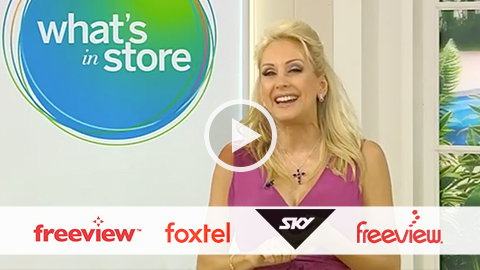 TVSN is always open, so you can shop whenever you want 24 hours a day, 7 days a week, on Freeview, Foxtel, Austar and Optus subscription TV channels or through our online store. TVSN allows you to shop in true comfort with no crowds, no queues and no parking hassles. Producing up to 14 hours of live programming every day, TVSN introduces more than 1,000 new products each month – many of them exclusive – to potential viewers in over 10 million households. In late 2013, the TVSN signal was expanded into New Zealand through Freeview and the Sky subscription TV network. With over 100,000 extremely loyal repeat customers, product categories include jewellery, health and beauty, homewares, electronics, fashion and collectables. The TVSN website features 24-hour live streaming of the channel as well as over 6,000 products, many of them supported by demonstration videos. Other video content on the site showcases catch-up TV, brand profiles, live chats with presenters and national competitions. The Expo Channel is a 24-hour, 7-day-a-week information channel consisting of direct response programming along with local productions. Expo has national sale representation in major capital cities, offering clients advertising opportunities in 30-second, 4-minute and 35-minute formats as well as exposure on the channel’s website. Expo is broadcast from Innovations Park Studios located at Direct Group’s Frenchs Forest headquarters. Expo has evolved into a leading television marketing vehicle for Australian DRTV advertisers, providing an outstanding opportunity to deliver a message that ultimately drives people to the advertiser’s own call centres, websites or retail locations. Since its launch on Optus cable in 2002, Expo has grown to broadcasting 24 hours on all platforms including Foxtel, Austar and Optus with a total reach of over 2 million households.